Out of Avalon and on to Andromeda, aural seer from Gallia travels back where it all began. 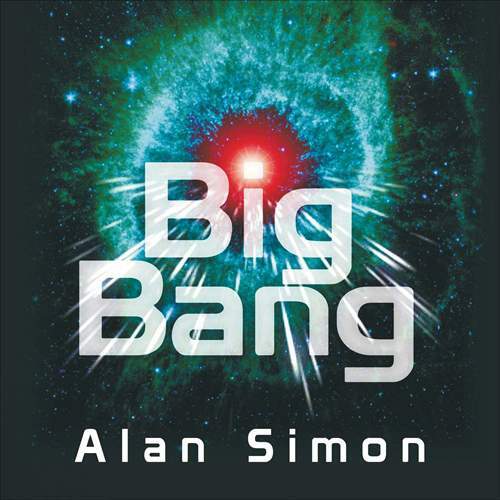 Alan Simon may alternate between such sagas as “Excalibur” – its fourth part preceding “Big Bang” – or even large stage-bound operas and less extravagant endeavors, yet their creative expanse remains the same. In fact, expanse is the main theme of this album that the French composer envisioned as a ballet, which can be the reason why, unlike on his previous works, there’s no abundance of vocals. The absence of solo singing won’t diminish the impact of the choir-abetted “Prologue Of The First Day” and the subsequent instrumental pieces, though, whose symphonic scope – outlined by a real orchestra playing here – appears pregnant with promise and doesn’t disappoint. Were they infused with more serenity, “The Soul Of The Stars” and “Chaos” could belong to a new-age realm, if not for various ivories setting anxiety in the record’s cosmic core and John Helliwell’s sax giving it romantic gravity. Still, sharp guitar riff, heavy drums and coarse harmonica make “Seven Moons In The Sky” break the blues levee and explode into space, before Roberto Tiranti’s voice is thrown in the loop, while the vibrancy of “Solarius” is refracted through folk lens, whereas “Starlight” marries the two methods and anchors the result to an organ-steamrolled terrain. Simon’s acoustic six strings which ripple through “Space Time” also give the number an earthly touch, yet it will take the spiritual funk of “The Journey” to send the middle-of-the-road flow on a delicious retro warp and lay the emotional ground for “Fools” that would wrap Michael Sadler’s desperate delivery in oratorio waves. But grandeur is kept in check on this album, brought to a close with the eternity-embracing “The Waltz Of The Universe” – because only the acceptance of the titular event allows to understand it enough to hear music of the spheres. Alan fashioned a dance to its rhythm, and his interstellar adventure can’t fail to gratify.